Bkper is a collaborative bookkeeping service that allows many people to access and work in a same book, with different levels of permissions, providing you a clear view on your financials, with real-time balance sheet and profit & loss statements. You can control how visible your books are to other people, from keeping books completely private to allowing anyone on the web to see them. Open the book you want to change the visibility. 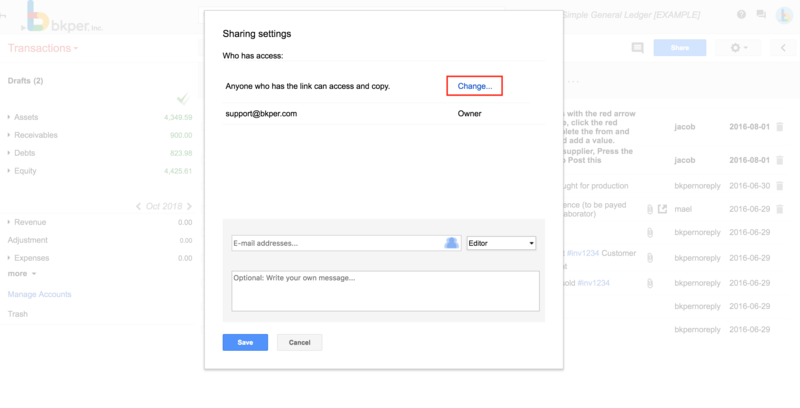 Click Change... on the first line of the Sharing Settings pop up window. Select Public or Private on the Book Visibility pop up window. 6. Click the green Save button for the visibility to become operative. Note: Any data in a Public Visible Book can be accessed by anyone with the link of the Book. When you share a book with other people, you have the choice to give them editing, recording, viewing and posting access. You can change this access at any time. 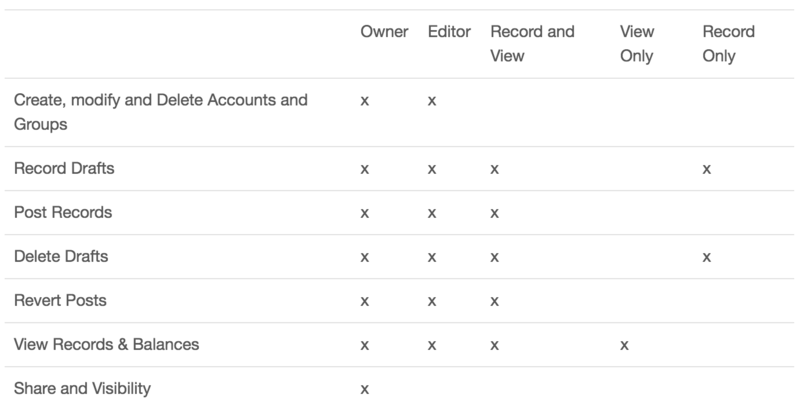 Here’s what people can do in a book with Owner, Editor, Record and View, View Only and Record Only permissions. Note: Record Only users, can only use their smartphones (iOs and Android) to record entries with the Bkper App. Share a book by choosing a type of access specific people have. 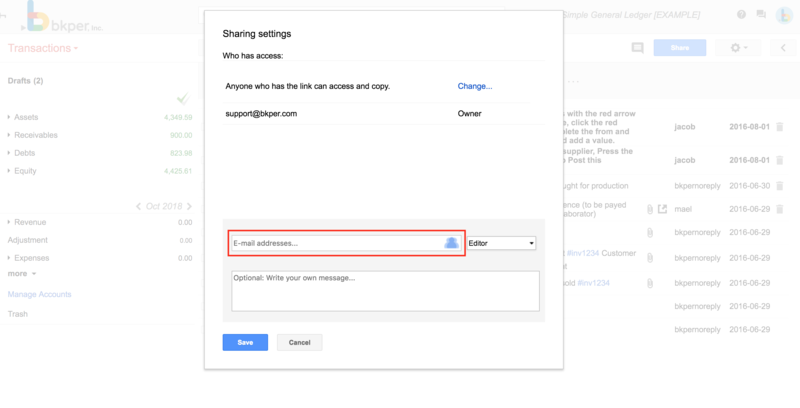 On the Sharing Settings pop up window, use the dropdown menu next to the email addresses to select the type of access you want them to have. Click the green Save button for the visibility to become operative. If you are the owner of a book, you can choose to remove or change permission settings. This allows you to control everyone who is able to access the book. 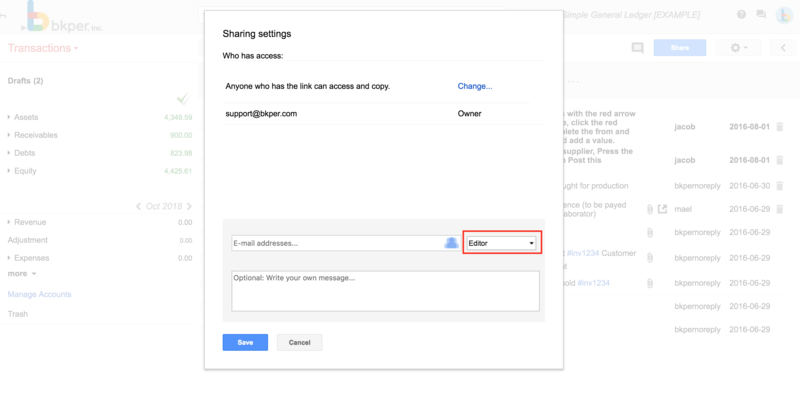 You can choose to allow bkper to autocomplete E-mail addresses for sharing with your Google Contacts. Note: Access to Google Contacts has no other purpose than to autocomplete your sharing e-mail addresses.